The image I have used is from Sheet 346. Isn't she so cute. I love these images as they are so sweet and innocent ... they make me think of my little girl skipping and playing. 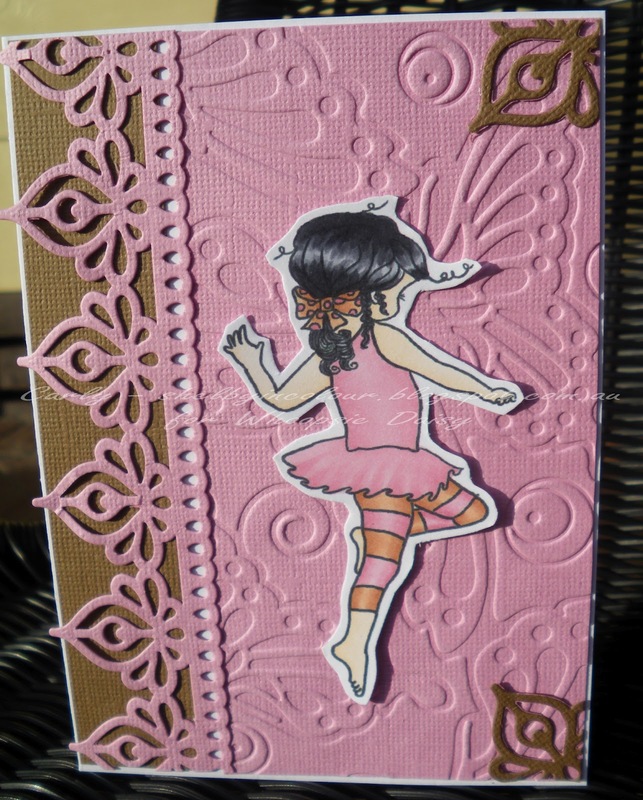 I have used one of my new Spellbinders Persian Accnets Dies to create the decorative edges and a gorgeous butterfly embossing folder in the background. The image is coloured in Copic Markers. You are going to love the totally sweet and magnificent pink creations by the Design Team this week. Head on over to the blog to check them out ...... by entering your own card and using a Whoopsi Daisy image you can win a lovely prize. If you don't have a Whoopsi Daisy image ... never fear .. you can find one FREE! here. Thanks so much for stopping by .... now I'm off to hunt in the cupboards for something sweet to eat ..... preferably pink .... maybe a Marshmallow! 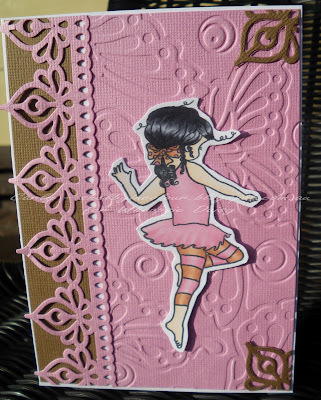 Great card, the die border goes wonderfully with the embossed background! This is gorgeous Carly, I love the embossed panel and your decorative edge. Oh Carly, I haven't used my Persian Accent dies yet. I think after seeing how gorgeous they look o your card I'm going to have to get them out and play! What a great card! Love the image too!